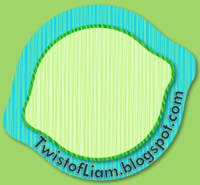 Teaching with a Twist of Liam: Thanks! Those of you faithful (and patient) followers who have been reading along since Twist of Liam was in it's infancy can attest to the fact that this blog has grown, changed, and evolved over the last 8 months. Design changes, html, flavicons, twitter, and comment replying are just a few of the changes that you may have witnessed as I incorporated this technological talent into my own repertoire. Feedback has been lovely with kind remarks abound. I love reading that I made someone giggle, chuckle, laugh out loud, or so hard that they snorted their coffee out their nose (sorry if it made a mess on the keyboard). I feel that the time I spend writing Twist of Liam is quickly justified when someone comments that they appreciate, or better yet will be using, or even BETTER yet HAVE used, an idea that I've shared. Yes, feedback is fabulous. Sometimes you get feedback that isn't so fun to read. An old post I wrote, called Punctuation Ninjas, recieved a recent visitor and, subsequently, a little comment. "I googled 'punctuation ninja' (as you do) and thought I would have quite liked to read this, until Firefox finished rendering and I saw the font. I can tell from the recent posts lists that there's a lot of content here, but I wouldn't be surprised to find that I'm not the only one who just bypasses it entirely because of the presentation. Just thought you might like to know." When I first read it, I thought to myself, Wow...what a goof! He let a stupid little thing like the font prevent him from reading and possibly even gaining a new idea. What a dumb-dumb. I even started to type up a little reply that said basically that same thing. Time was limited so I left it to return to later. Leaving it for later meant I had time to stew over it, get angry, moan and mutter to myself, and then come back to it. And isn't it funny? When I clicked on repy the second time around, my attitude had completely changed! I wasn't angry and offended anymore, I was thankful that someone took the time to help me be better! He saw something that could be holding me back and offered his two cents worth. And it's funny how things work out. Not long later, I got a wonderful comment on a more current blog. I was beside myself in shock as I read that I was Jodi's next pick as Feature Teacher. I told Ms M, authour at Ms. M's Blog and A Teacher's Plan and one of the longest standing ToL readers (Yes, I've adopted my own acronym), "I guess this is how it must feel if you were to save a kitten from a burning tree in the middle of nowhere while sleepwalking only to wake up and not have a clue what you did that everyone is applauding you for!" I didn't think I was doing anything special. Jodi disagrees, apparently. Ya think?!? ToL is still only young so, yeah, I still check out my stats practically daily. And to be honest, I will probably continue to watch my stats well into it's awkward adolescence. But thanks to that Jodi's feature, that was the busiest traffic day I've had. Ever. Thanks to the traffic, My followers have doubled. DOUBLED. And thanks to Tony, I had changed the font and my recent visitors have been able to enjoy the content easier. Put the two together and it's funny how things work out. So, thank you Tony for the feedback. I hope you come back soon and see the changes. Thank you Jodi for the wonderful praise and attention that your feature has afforded me. I hope I can live up to the expectations of your readers who have hopped aboard. Thank you readers who have been around and helped Twist of Liam grow. There are too many to mention here but you know and I know who you are. I hope you all continue to enjoy reading my blog. And thank you to the new readers that have joined in and given my blog a chance. I hope you find it worth following and, if you do, share the ideas you find here. wow...very well said :) can't wait to "get to know you!" You're so welcome! I've been crushing on your blog for awhile and it was time for others to enjoy. It makes me feel special to know that people listened when I told them to visit. Who knew? Have a great weekend cyber buddy! Now you've gone and made me blush! As one of those who listened to you, Jodi, let me just say, I love your CFClassroom blog and I'm loving, Liam, your writing style, as Jodi said we would. I look forward to reading more from both your blogs. Hey thanks for the shout out. Now I am famous by proxy. :P Actually I am pretty honored that I am "one of the longest standing ToL readers." Oh and I love Jodi's term "blog crushing" I will have to borrow that. Congrats Liam! I am one of your newest readers and can't wait to spend a lot of time here reading and learning. I also really love and appreciate the new font. It is much easier to read. I just started my own blog this weekend. Tonight I was tagged. I am not sure the etiquette on this but I am passing the tag onto you.. http://thinkwonderteach.blogspot.com/2012/01/tag.html. It was extremely hard to come up with 12 peeps to tag! So glad you mentioned that you check your stats. I started my blog and was so excited to get my first follower and my first comment that I let the kids have oreos for dinner. What is gonna happen if I make it to 10?? ?